This contest is now closed. Jackie won the book! Jeannie Lin is one of those authors for me where the moment I start the book, I get an immediate sense of rightness and satisfaction, and I continue to feel that way right up until the end. Ending a book in a way that is completely satisfying is one of the most difficult things to do. I can think of loads of books where I love love love everything about it…except I wish the ending had just been a little different. Jeannie Lin knows exactly how to write an ending so that it feels like the best way, the only way the story could have gone, and so that nothing is rushed or drags on. Plus her characters always feel so real and endearing, and the dilemmas they face seem insurmountable…until they’re surmounted. 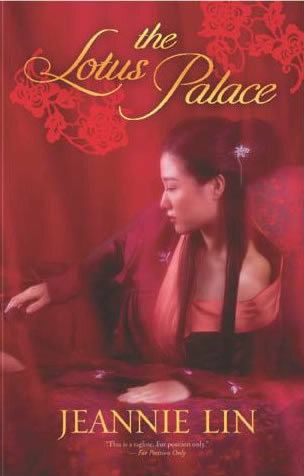 The Lotus Palace is first in a new Tang Dynasty series and I can’t wait to read the next one! And I’ve got a signed copy to give away. I absolutely adored Yue-ying. Heroines who have been forced by life to become deeply practical, even cynical, but who feel deeply underneath are one of my top favorite tropes, and this delivered–and yet Yue-ying retained a sweetness and kindness despite her inability to trust or even hope, which I really enjoyed. Bai is also one of my favorite tropes, the aristocrat posing as a loveable but airheaded fop for a Secret Reason. I loved how his charm and sincerity with Yue-ying, and his earnest determination to help people, weren’t allowed to wipe away his rich, privileged cluelessness. He had some hard lessons to learn and it was great to watch him learn them. Plus, a compelling murder mystery! What more can you ask for?